If you find yourself searching about teething, I’m sorry. It’s not a topic you want to be looking into, as it most likely means that you and your baby are having quite the time right now. You may notice that they are irritable, drooling, have swollen gums, are chewing on everything, having trouble sleeping, and may have a tooth visible just under the surface. A baby’s first tooth usually comes in between age 3-9 months, however it could happen as late as 14 months. Most of the time teeth come in in pairs, starting with the bottom center two followed by the upper center two teeth, however this is not always the case. Giving your little one something cold can help soothe their painful and swollen gums. One way to do this is to give them a mesh feeder filled with frozen fruits or vegetables. The cold will reduce inflammation and pain, and the yummy food will help distract them. There are also teethers that are made to be refrigerated that can provide some relief. Another option to help with teething pain is to gently massage your baby’s gums, but make sure your hands are clean and your nails are not sharp first. Something else that may be worth trying is having your child wear a raw amber teething necklace. Some parents have sworn that they noticed a big reduction in teething symptoms after putting one on their child. The reasoning is that the succinic acid in the amber absorbed by the skin has analgesic properties. They are meant to be taken off during sleep and not to be chewed on, however. It is recommended to brush a baby’s teeth twice a day. While some babies enjoy having their teeth brushed, most do not. Since their gums are already sore, try not to brush too aggressively. 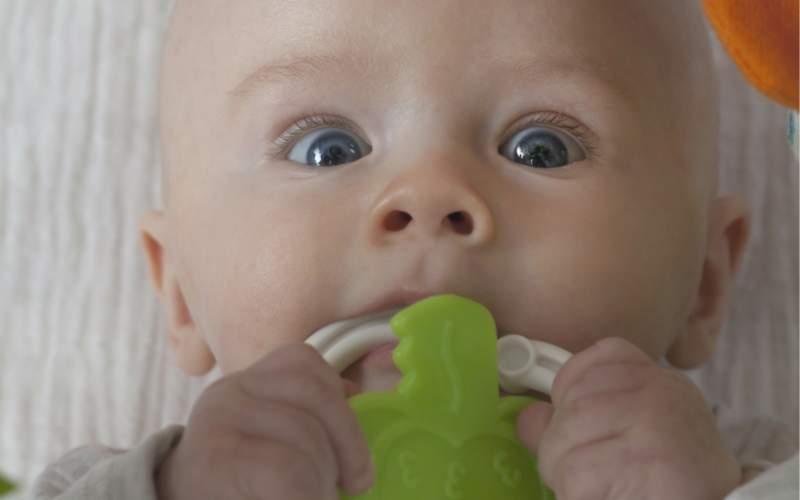 If your baby has a lip tie, pay extra attention to cleaning the top center four teeth as the lip can trap food debris. You can clean a baby’s teeth by using a damp washcloth, a finger toothbrush, or a first toothbrush like the “Raz-baby infant toothbrush”. The “Raz-baby infant toothbrush” is nice because the nubs on the back are also soothing on their sore gums. Teething is unfortunately not a short process, but you will find that there are times in between sets of teeth breaking through when your child is less irritable. While you can’t take all of your little one’s pain away, you can relieve some of it and help you both to get through this trying time. ← What Should I Pack in my Hospital Bag for Labor?